AEI is the American Enterprise Institute — a Republican partisan propaganda outfit, masquerading as an organization that “operates independently of any political party and has no institutional positions.” While AEI is primarily known for its “free market” advocacy, the group is also the leading war-promoting machine. 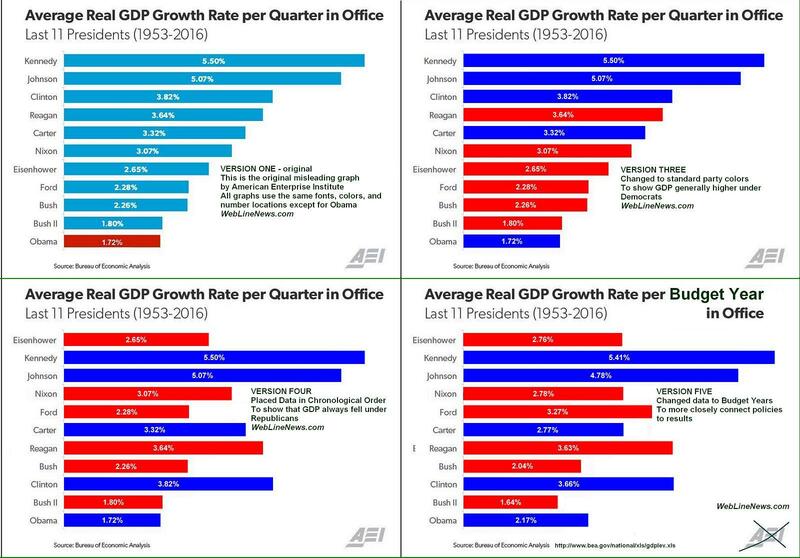 Recently, AEI released this graph comparing GDP (Gross Domestic Product) growth during the last eleven administrations. We will be correcting this graph until it is accurate. This will require four steps. According to the group’s website, “AEI’s 501(c)(3) tax status also forbids it from participating in any campaign for elected public office.” So, it must have been an accident that only the Obama bar graph was sore-thumb red with thinner numbers that were pushed down lower on the graph. Let’s fix these three items. 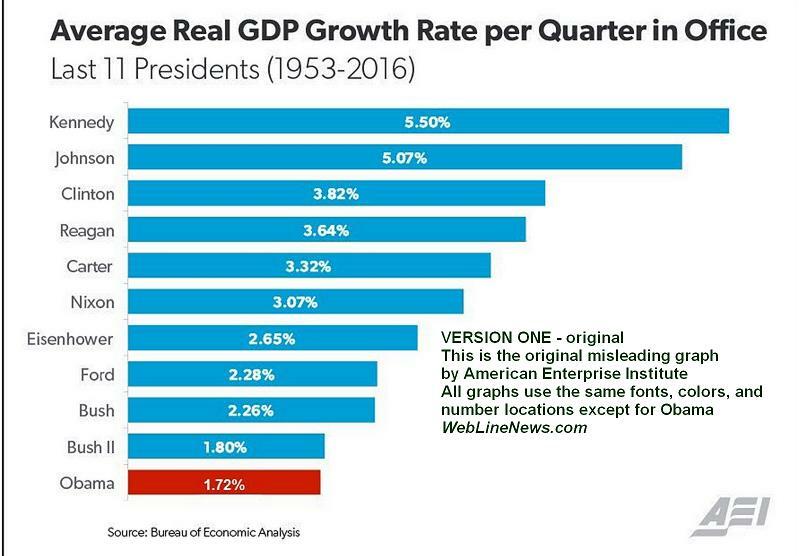 Now, the blatant propaganda has been removed, but Obama still looks pretty bad. Look at that. Generally speaking, Democrats preside over better times, with four of the top five, while Republicans preside over worse times, with four of the bottom five. 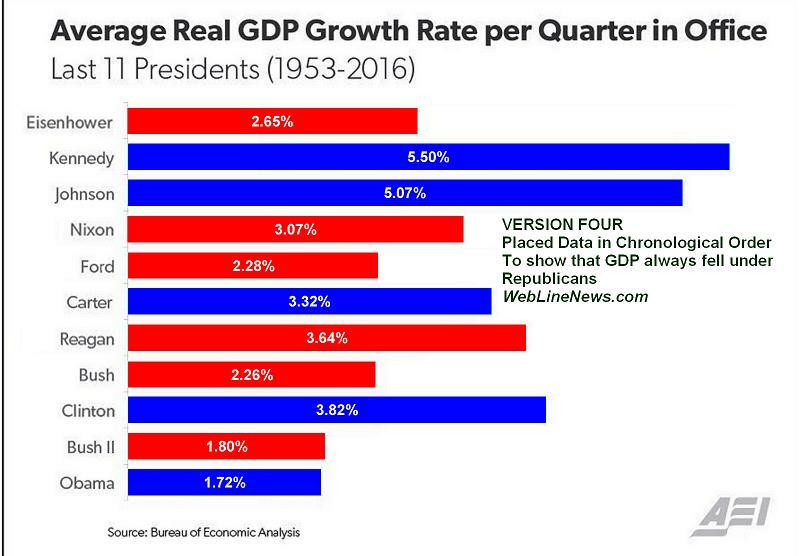 But Obama still looks pretty bad. That doesn’t look good for Republicans on the economy at all now. Nope, the average GDP growth under Republicans always dropped after Democrats, without exception until — Obama who still looks pretty bad. Rather than using “per Quarter in Office,” we are now using “per Budget Year in Office.” The major budget activity on an annual basis is when the White House introduces its budget. The budget period begins October and ends September of the next year. While there may be changes that occur over the period, for the most part, spending decisions are made in advance. In addition, economic effects tend to lag behind changes in policy. 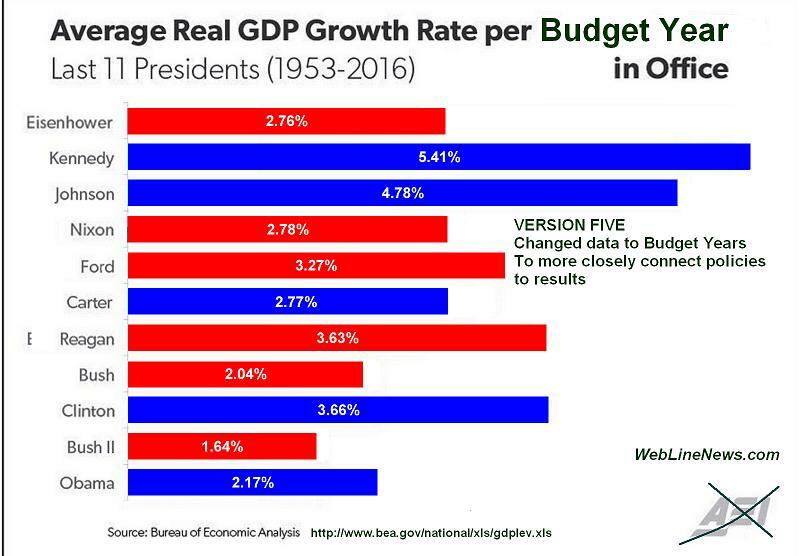 For these two important reasons, the fairest way to study GDP effects is by budget years. « We’re in a Low-Growth World. Is This Really the Economic Problem?